A Walsall service co-run by St Giles Hospice to improve support for people with dementia in care homes and help them prepare for the end of their lives has won a prestigious award for its groundbreaking work. 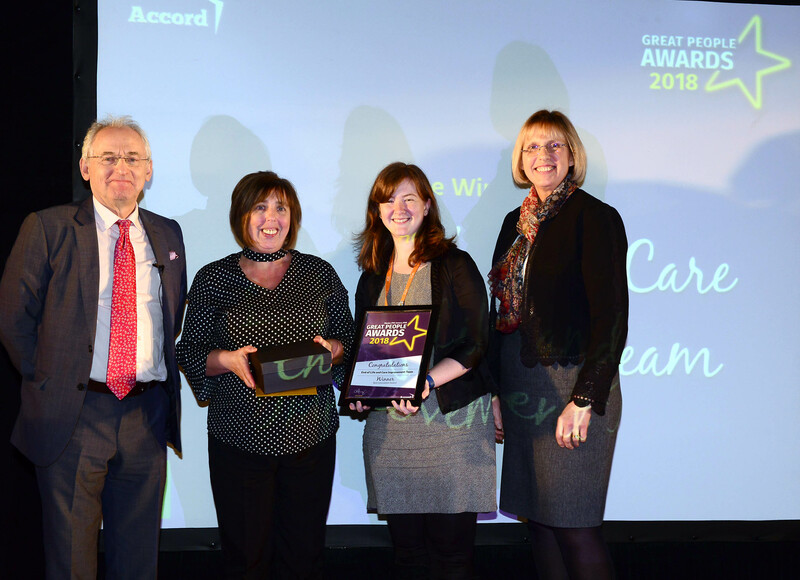 The Care Improvement and End-of-Life Service received the best innovation title at the Accord Great People Awards, an annual event hosted by Accord, which took place at Old Tree Nursery, in Pendeford Hall Lane on January 29 2018. The service is run by community-based dementia support workers Emily Pardoe-Billings from St Giles Hospice Walsall and Pat Roberts from Pathways 4 Life, a partnership between Accord and Age UK Walsall funded by Walsall Clinical Commissioning Group. Emily said: “We’re absolutely delighted to receive the award – our work can be extremely challenging at times but it’s great to know people recognise it’s something valuable and that it makes a difference to the quality of people’s lives. Pat and Emily currently work with around 30 care homes in Walsall. They use their knowledge and experience to improve dementia and end-of-life care to empower care home staff, people with dementia and their families through development sessions, support and guidance. This involves helping to create safe and relaxing spaces and providing meaningful person-centred activities, some suitable for people even at the very end stages of their lives. It also includes helping staff to understand the needs of people with dementia more fully and to help them to feel more confident that they can support them effectively. The service was set up as a pilot in 2015 but has been so successful in helping patients, families and staff and reducing the number of unnecessary hospital admissions that it was made permanent in 2017, and last year it was one of four finalists in the National Dementia Care Awards.